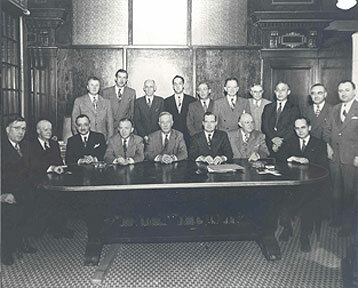 The first annual meeting of The Aurora Foundation (now Community Foundation of the Fox River Valley) was held on November 23, 1948 at the office of the Aurora Chamber of Commerce. Seated (left to right): Walter R. O’Malley, Charles P. Wright, Charles W. Hoefer, Arthur L. Podolak, William B. Greene, Frank R. Reid, Jr., Justus L. Johnson and James E. Milroy. Standing (left to right): W. L. “Les” McCullough, Frank S. Main, Mayor Henry Rauscher, Carl Schmitz, Ray Hanson, Clarence J. Ruddy, Emery S. Fowler, Elmer A. Hermes, Donald J. DeFrates and John P. Thill.